This 2 bedroom, 2 bath condominium apartment is located on Isla Verde Ave. The complex is right in front of the Intercontinental Hotel. It also includes a spacious pool, excellent for swimming or just soaking in the sun. The apartment is tastefully decorated and furnished throughout with all amenities. It includes cable TV, air conditioning and ceiling fans. A 2 bedroom 2 bath apartment with fully equipped kitchen, Air conditioning, Ceiling fans, Cable TV, W/D, 1 Queen Size bed in master bedroom, 2 Twins in guest. The unit includes 2 Parking spaces with 24 hour security, Pool. 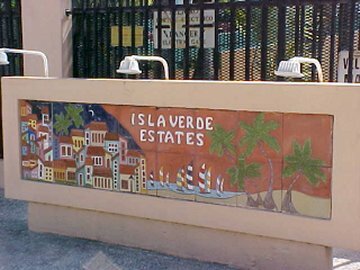 Located in the popular Isla Verde district of San Juan, Puerto Rico. Price for accommodations: $1800/month + utilities " 6 month min." 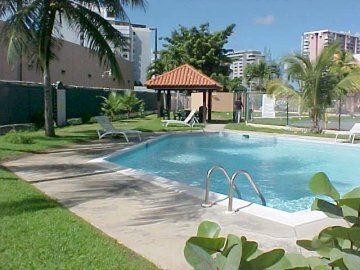 This caribbean vacation rental apartment is located in the beautiful Isla Verde Estates complex located in Isla Verde. The beach is a very popular white and golden sandy beach suitable for sun bathing, swimming, wind surfing, and other water activities. It is just a short distance away from the El San Juan Hotel & Casino, and only 5 minutes from the airport.